Italy coach Jacques Brunel has made only one change from the side that beat France last weekend for Saturday's Six Nations encounter against Scotland. Inside centre Gonzalo Canale replaces Alberto Sgarbi, who was injured in the Azzurri's stirring 23-18 victory over the French in Rome on Sunday. The half-back pairing of Luciano Orquera and Tobias Botes retain their place in the team. Loose-head prop Andrea Lo Cicero will pick up his 100th cap at Murrayfield. This will leave him just one behind the record of Alessandro Troncon. Orquera kicked 10 points in the France victory at the Stadio Olimpico before Kris Burton sealed the win with a 68th-minute drop-goal. Burton again starts on the bench for Italy, who are seeking their third Six Nations win on the trot having ended last year's tournament with victory over Scotland. Brunel said: "The team has really grown and against France they demonstrated their strength. It's the right time to manage Italy. "We've worked a lot on our team and a lot on our game and I liked a lot of what I saw against France. "Everyone says Scotland are not a great team at the moment but they are a hard team to play against, especially at Murrayfield, and last year they gave a lot of teams problems." 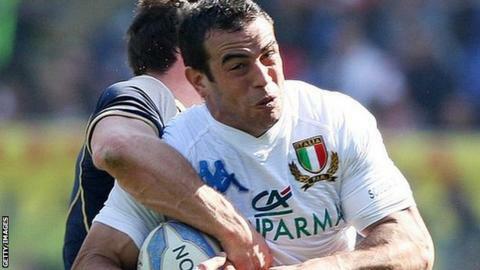 Italy's next Six Nations game at home is against Wales on 23 February. Italy: Andrea Masi (Wasps); Giovanbattista Venditti (Zebre), Tommaso Benvenuti (Treviso), Gonzalo Canale (La Rochelle), Luke McLean (Treviso); Luciano Orquera (Zebre), Tobias Botes (Treviso); Andrea Lo Cicero (Racing Metro), Leonardo Ghiraldini (Treviso), Martin Castrogiovanni (Leicester), Quintin Geldenhuys (Zebre), Francesco Minto (Treviso), Alessandro Zanni (Treviso), Simone Favaro (Treviso), Sergio Parisse (Stade Francais capt).